Background: The physical and mental health among prisoners is worse than the general population as their health is usually ignored. Objectives: The main objectives of this study is (1). To assess the physical, mental, and social well-being of the inmates of an open prison. (2). To find out the association of duration of stay in open prison with psychiatric well-being and depression among them. Subjects and Methods: It was a cross-sectional study conducted from June to October 2016 among the prisoners of an open prison. A total of 71 inmates out of 86 were included after taking necessary permission and consent. Data were collected by the semi-structured questionnaire, including the personal data sheet, General Health Questionnaire-12, and Hamilton Rating Scale for Depression and Anxiety. Mean and standard deviation, proportions, and correlation were used to analyze the data. Results: This jail was meant only for males. Mean age of the participants was 46 ± 10.99 years. Among the inmates, 23.9% were current smokers. Among them, 46.5% had mild depression and 2.8% had moderate depression. There was statistically significant negative correlation between the duration of stay in open prison with psychiatric well-being (r = −0.318; P = 0.007) and with depression (r = −0.307; P = 0.010). Nearly 87.3% of the participants said that open prison is better than the conventional prison. Conclusion: Thus, it may be said that open prison is a better place for maintaining a healthy lifestyle among the inmates. Periodic psychiatric check-up and counseling should be more strengthened for the betterment of inmates. For every human being, it is a fundamental right to enjoy the highest attainable standard of physical and mental health without discrimination. However, the prisoners are most condemned living souls of the society have their health condition usually ignored. Hence, it is evident that they carry more disease burden than others in society. According to the recent studies, the mental illness rate among prisoners is three times higher than that with the general population. Mentally ill prisoners find extremely difficult in adjusting the prison rules. Open prisons are prisons with minimum security cover (prisons without bars), in which the prisoners are trusted to the extent that they can wait on their verdict with minimal administration and peripheral security. Prisoners with good behavior, satisfying certain norms prescribed in the prison rules are placed in open prisons. During the day, inmates of these prisons are allowed to go market, but they have to come back by evening. There is an absence of safeguard against escape, such as walls, bars, locks, and armed guards, i.e., one given the luxury of open surveillance. Prisoners, here, are committed to the agricultural and other activities and their function is with a sense of self-liability, self-restraint, and self-assurance. Open prisons reduce overcrowding in jails, reward good conduct, give training in self-reliance, provide dependable permanent labor for public works, prevent frustrations and create hope among long-termers, offer training in the agriculture and manufacture, examine the suitability of releasing offenders from prisons, and also enable the prisoners to be with their family members (in some countries). To find out the association of duration of stay in open prison with psychiatric well-being and with depression among them. This was a cross-sectional study which was conducted in the Biju Patnaik open-air ashram during the period from June to October 2016. After getting necessary permission from the appropriate authorities, all inmates of Biju Patnaik open-air ashram were approached for consent. Those who gave consent (71 out of 86 inmates) for participating in the study were included. Sometime was spent for gaining the confidence of the inmates and confidentiality was assured. Data were collected using a semi-structured questionnaire which included personal data sheet, General Health Questionnaire-12 (GHQ-12) for assessing the psychiatric well-being, Hamilton rating scale for Depression (HAM-D), and Hamilton rating scale for anxiety (HAM-A). A validated schedule was used to collect socio-demographic variables, perceived health problems, and general and systemic examination. The GHQ is a self-administered screening test designed to assess the psychiatric well-being of the target population. It was developed by Goldberg in 1972. It has 12 items. It has been validated in India in Hindi by Gautam et al. in 1987. This scale was originally published by Max Hamilton and revised it in 1966, 1967, 1969, and 1980. The questionnaire is designed for adults, and it is used to rate the severity of their depression by probing mood, feelings of guilt, suicide ideation, insomnia, agitation or retardation, anxiety, weight loss, and somatic symptoms. Each item on the questionnaire is scored on 4-point scale, depending on the item, and the total score is compared which helps to determine the level of depression. This scale was originally published by Max Hamilton in 1959. The scale consists of 14 items designed to assess the severity of a patient's anxiety. Each of the 14 items contains some symptoms, and each group of symptoms is rated on a scale of 0–4, with four being the most severe. These scores are used to compute an overarching score that indicates a person's anxiety severity. Data were entered into Excel sheet, and statistical analysis was performed using SPSS software version 20.0 (SPSS Inc., Chicago, IL) licensed to the institution. Statistical measures such as mean, proportion, and correlation tests were used. There were 86 male inmates and of them, 71 (82.5%) gave consent for participation. The mean age of the participants was 46 ± 10.99 years, ranging from 30 to 70 years. Of 71 participants, most of them were Hindus (94.4%). Nearly 35.2% of them were of general caste, 25.4% were of scheduled caste, and 26.8% were of scheduled tribes. Most of them were from rural area (94.4%). About 23.9% of them belonged to joint family, 63.4% were married, 32.4% were single, one person was divorced, and two persons were widows. Education of our study population was categorized according to the Indian Standard Classification of Education by the Government of India, the Ministry of human resource development, and the Department of higher education, New Delhi, 2014. We found that among the inmates around one-third (31%) were illiterate, and a greater portion (42.2%) had preprimary education. There was no one graduate in the study population. When enquired about past occupation, it was found out that 81.8% were unskilled workers, 9.8% were skilled workers, 5.6% were students, and 2.8% were shop owners. Tobacco was the most common form of addiction among these prisoners. Nearly 75% of them were addicted to tobacco, out of which 30.18% were by smoking, 32.07% by chewing (most commonly paan, gutkha, and khaini), and 37.7% by both. About 23.9% of the inmates were current smokers, 49.3% had never smoked in life, whereas 26.8% were former smokers. Mean age of initiation of smoking was 16.64 ± 2.64 years and alcohol was 17.76 ± 2.33 years. Mean age of initiation of use of chewable forms of tobacco was 20 ± 4.7 years and the mean duration of use was 26.48 ± 10.06 years. In this study, majority of the inmates had one or more morbid conditions. Most common problems expressed were as follows: generalized weakness (23%), knee pain (21%), nonspecific headache (12%), gastritis and pain abdomen (10%), eye disorders (4%), loss of appetite (3%), hearing problem (2%), neck pain (2%), cough (1%), and constipation (1%). On clinical examination, it was revealed that 20% had pallor and one had clubbing. One had diabetes, one had hypertension, and both were on medication. Regarding the past illness, four inmates had TB after coming to the jail, and all of them were treated with full course. Mean height of the inmates was 1.57 ± 0.061 mt, mean weight was 58.70 ± 7.62 kg, and mean body mass index (BMI) was 23.81 ± 3.04 kg/m2. According to the WHO classification, they were classified as: underweight (BMI < 18.5), normal (BMI 18.5–24.99), overweight (25–29.99), or obese (BMI ≥30). Among them, 2.8% were obese, 29.60% were overweight, 66.20% were normal, and 1.40% was underweight. On the basis of risks for cardiovascular diseases, 45.1% had increased risk (BMI = 23–27.5), and 11.3% had high risk (BMI >27.5). 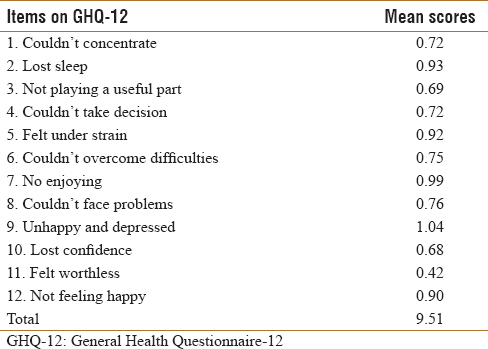 Psychiatric well-being is calculated by the GHQ-12. In this study, we use cut-off score for “definite psychiatric” case as 16, meaning thereby that those having a score of 16 and above are “definite psychiatric” cases, those scoring from 8 to 15 are “probable psychiatric” cases and need to be carefully evaluated. Cases in those scoring 7 and below are normal. We found that 63.4% probably had some psychiatric disorder, 7% definitely had some psychiatric disorder, and only 29.6% were normal. Prisoners obtained a high score on the components of unhappy and depressed, no enjoying, lost sleep, felt under strain, not feeling happy, i.e., point no 9, 7, 2, 5, 12 [Table 2]. Apart from this, their obtained scores on other items of GHQ such as 1, 3, 4, 6, 8, 10, and 11 were within the normal range. The cut-off point of the score is 0.79 as the Likert method of scoring was used to score the response [Figure 1]. GHQ-12 revealed the prisoners' depression, sleeplessness, unhappiness, and inability to enjoy life indicate their tendency to developmental disorders in the near future. We used Hamilton depression scale to find out depression among inmates and Hamilton anxiety scale to find out anxiety disorder. We found that half of the inmates had depression. 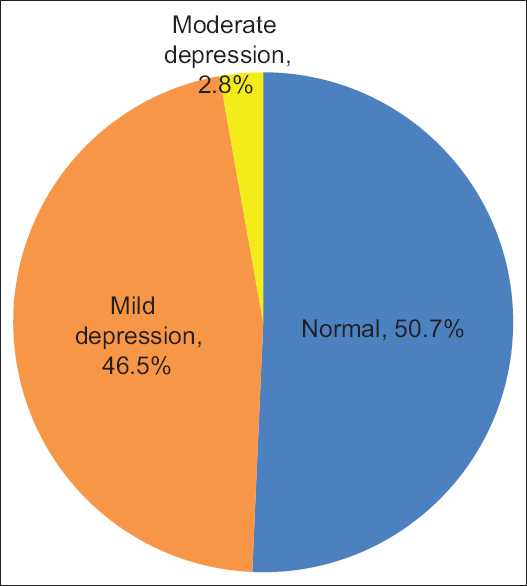 [Figure 2] shows that 46.5% had mild depression and 2.8% had moderate depression. However, no one of them had an anxiety disorder. Correlation of days spent in open prison was conducted with the other continuous variables using the Spearman's rank correlation. We found a significant negative correlation [Table 3] between the days spent in the open prison and the psychiatric well-being (r = −0.318 and P = 0.007), which means more number of days spent in open prison was associated with low-GHQ-12 score. Another negative correlation was found between days spent in open prison and depression (r = −0.307 and P = 0.010). Thus, it may be said that open prison is better place to maintain a healthy lifestyle among the inmates. In this study, 87.3% inmates said that open prison is better, only 4.2% said that conventional prison is better, and for 8.5% said both were the same. 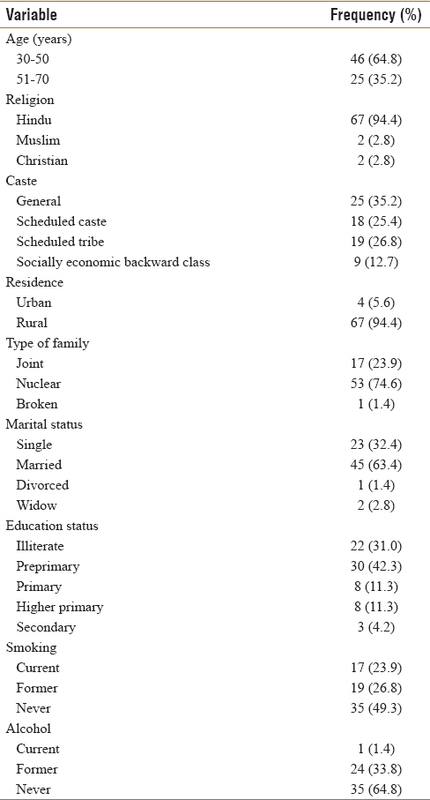 This means they experienced a better quality of life in open prison [Table 1]. They preferred open prison as they had access to the outside world, they can move outside in the daytime. In this study, most of the inmates were from rural area which is consistent with the study done by Kumar et al. in the central prison in Gulbarga, India. This may be attributed to conflicts occurring in rural places owing to illiteracy, unemployment, and social mixing as compared to urban where people are relatively confined to their own. In our study, we found that the education of most of the inmates is limited to preprimary level which is similar with the study done by Aggarwal et al. in Amritsar jail. A narrative review by Fiona Kouyoumdjian et al. in Canada, found that many persons in the prison reported having initiated alcohol and drug use at a young age. This finding is corroborates our study, i.e., mean age of initiation of smoking was 16.64 ± 2.64 years and alcohol was 17.76 ± 2.33 years. According to the study by Gupta et al., the common health problems among the inmates were skin disorders (58%), dental problems (39%), ENT problems (36%), respiratory disorders (29%), and eye problems (26%) etc., but in our study, the major problems encountered by the inmates were generalized weakness (23%), knee pain (21%), nonspecific headache (12%), gastritis and pain abdomen (10%), and eye disorders (4%) etc. Another study done by Zabala-Baños et al. done in Spain revealed that lifelong continuation of any mental disorder was 90.2% among the inmates. In our study, we found that 63.4% probably had some psychiatric disorder and 7% definitely had some psychiatric disorder. This may be because of the difference in nature of the prisons. That study in Spain was done in conventional prison while our study was done in open prison. 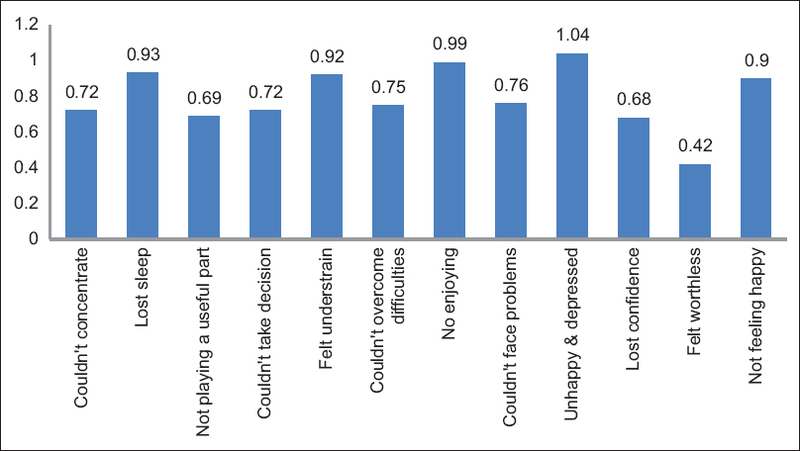 In a study in district jail of Dhanbad (Jharkhand) by Sinha, prisoners obtained very high score on items “No enjoying”, “Unhappy and distressed,” “Not feeling happy,” and “could not face problem.” This finding is similar with the findings of our study except the item of “could not face problem.” This might be because of their group activity, improved self-liability, and self-assurance in an open prison. Basically, they stayed together, worked together, and moved freely with much less confinement period; which helped them to lead a better lifestyle in open prison than that of the conventional prison. A study conducted by Beyen et al. in Ethiopia, revealed that about 44% showed signs of depression. Vélez-Álvarez et al. in their study done in Colombia, reported that 38.6% inmates presented with symptoms of depression (2.6% presented symptoms of severe depression, 8.6% of moderate depression, and 27.4% of mild depression). Another study done by Hamid H et al. among women inmates of central prison, Peshawar, and Pakistan revealed that 43.8% of prisoners were found to have mild depression, 12.5% had moderate depression, and 3.1% had severe depression. While in our study, no inmates had severe depression, 3% had moderate depression, and 46% had mild depression. The difference of the results may be due to difference in scales used, type of prison, variations in geographical regions, and lifestyles of the prisoners, etc. Most common health problems among the inmates of open prison were generalized weakness, knee pain, nonspecific headache, and nearly half of the inmates had depression. Duration of stay in open prison was found to be negatively correlated with psychiatric well-being and depression. Most of them (87%) preferred open prison. Thus, it may be said that open prison is a better place to maintain a healthy lifestyle among the inmates. Further comparative study is needed to find out the differences in health status between the inmates of open and conventional prisons. Periodic psychiatric check-up and counseling should be more strengthened for the betterment of inmates. This study was financially supported by Siksha “O” Anusandhan University. Gupta RK, Singh GP, Gupta RR. Health status of inmates of a prison. Indian J Community Med 2001;26:86-9. Constantino P, Assis SG, Pinto LW. The impact of prisons on the mental health of prisoners in the state of Rio de Janeiro, Brazil. Cien Saude Colet 2016;21:2089-100. Bura R. Notes on Open Prisons in India; 2012. Available from: http://www.preservearticles.com/2012050131655/notes-on-open-prisons-in-india.html. [Last accessed on 2017 Apr 18]. Jacob KS, Bhugra D, Mann AH. General health questionnaire – 12: Psychometric properties and factor structure among Indian women living in the United Kingdom. Indian J Psychiatry 1997;39:196-9. Gautam S, Nijhawan M, Kamal P. Standardisation of Hindi version of goldbergs general health questionnaire. Indian J Psychiatry 1987;29:63-6. Hamilton M. A rating scale for depression. J Neurol Neurosurg Psychiatry 1960;23:56-62. Hamilton M. The assessment of anxiety states by rating. Br J Med Psychol 1959;32:50-5.
WHO Expert Consultation. Appropriate body-mass index for Asian populations and its implications for policy and intervention strategies. Lancet 2004;363:157-63. Kumar SD, Kumar SA, Pattankar JV, Reddy SB, Dhar M. Health status of the prisoners in a central jail of South India. Indian J Psychol Med 2013;35:373-7. Aggarwal A, Arora U, Nagpal N. Seroprevalence of HIV in central jail inmates of amritsar. Indian J Community Med 2005;30:151. Kouyoumdjian F, Schuler A, Matheson FI, Hwang SW. Health status of prisoners in Canada: Narrative review. Can Fam Physician 2016;62:215-22. Zabala-Baños MC, Segura A, Maestre-Miquel C, Martínez-Lorca M, Rodríguez-Martín B, Romero D, et al. Mental disorder prevalence and associated risk factors in three prisons of Spain. Rev Esp Sanid Penit 2016;18:13-23. Sinha S. Adjustment and mental health problem in prisoners. Ind Psychiatry J 2010;19:101-4. Beyen TK, Dadi AF, Dachew BA, Muluneh NY, Bisetegn TA. More than eight in every nineteen inmates were living with depression at prisons of Northwest Amhara regional state, Ethiopia, a cross sectional study design. BMC Psychiatry 2017;17:31. Vélez-Álvarez C, Barrera-Valencia C, Benito-Devia AV, Figueroa-Barrera M, Franco-Idarraga SM. Study of depressive symptoms according to Zung's self-rating scale on men deprived of freedom in a city of Colombia. Rev Esp Sanid Penit 2016;18:43-8. Hamid H. Incidence of depression among incarcerated woman in central Prison, Peshawar, Pakistan. Eur J Gen Med 2012;9:33-8.